You work so hard to protect your business and assets, why risk letting it go out the door (literally!) According to the National Retail Security Survey, the U.S. retail industry lost more than $35 billion to theft alone in 2011. And according to Employee Theft Solutions, companies lose an estimated $400 billion per year in productivity due to time theft. An affordable and proactive solution to keep your business safe is to get a security system for your company. Whether it’s jewelry you sell at a retail store or private health records at a doctor’s office, you don’t want to let your goods or important data get into the wrong hands of a thief, or perhaps even one of your employees. Chances are you already have a high speed internet connection at your business. Well using a completely wireless system you can connect right to your existing system and have speedy alarm signals. By using wireless technology paired with a security camera, you’ll also have access to keep watch over your business when you are offsite via a smartphone or computer. You can also go the wired or hybrid security system route but it is a little more involved. You can read more about wired vs. wireless alarm systems here. 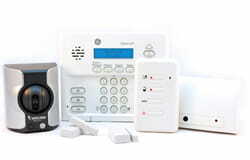 Many traditional home alarm companies also offer business packages for your small business. Protect America has made a business package that’s comes with all the essentials you need to get set up and secure quickly. The package includes 2 door/window sensors (to protect the front/back entrance), a glass break detector (for all those “window shoppers”, and an interactive video security camera (to keep an eye on your business from afar). If any of these sensors are triggered you can rest assured that their monitoring it and will send authorities on the way to remedy the situation. Of course, they can customize any package to meet your specific business needs, but at least this starter package can get you started. To speak with a Protect America specialist about your business needs call (888) 255-7812 or visit the Protect America website. Have a larger business? Guardian has custom built commercial alarm systems, built to spec and even come with an exclusive, VIP customer service line. Have multiple business locations? No problem, Guardian has software that allows you to log in online and track all your locations at once. You can access alarm activity, see the event history remotely, change user codes, manage restricted area access, and even program doors to lock at specific times, all online. Visit Guardian Protection or call 866-533-6717 to learn more. Not quite ready to make the jump? Some companies like SafeMart offer a no-risk trial that allows you to try it out, no strings attached. Call 888-793-5462 or visit SafeMart to request a demo account. Think of an interactive video security camera as an extra set of eyes to not only make sure your employees are not stealing but also to ensure they are not wasting valuable time and resources on the job. By using the app, you’ll be able to take your company with you wherever you go and have full 24/7 access to it in your pocket. Now you can sleep at night knowing that you have a way to watch after your business after hours. Video cameras are also a great way to discourage potential theft. By keeping the camera in a visible area, potential shoplifters or unmotivated employees will know they are being watched. You can even take it one step further by posting a sign that says there is a surveillance camera in use, like many retail dressing rooms or parking garages do. It’s a good idea to go ahead and give your building management or landlord a heads up in advance of your new system. They’ll appreciate that you are taking the extra precaution to be protected, but they might have restrictions or guidelines that you should be aware of. Also be sure to check to see if there are any restrictions in your area on whether public surveillance is allowed and how it can be used. Lastly, check with your local police department to see if your city/county requires any special permits. Jim Angleton, the President of AEGIS FinServ, a corporate prepaid debit card company, works in an industry with technologies that can attract corporate espionage. Due to the nature of their business, they have more than 300 cameras installed inside and outside their 5,000 square foot facility. They insist guests power down all electronic devices and place them in secured lockers at the point of entry to their facilities. They also fully disclose that no electronic devices are welcome beyond the reception area. Catching a Potential Thief in Action at Children’s World & Children’s World Uniform Supply, Inc. It has also allowed them to watch potential shoplifters in the store, and even their vehicles in the parking lot. They had an instance where a group of people came in the store who were acting suspicious. One employee watched them on the security cameras and called the police while everyone else was paged with a secret code to watch the floor closely. The group caught on that we were on to them, and left the store with nothing. To take extra precaution, the company obtained the prospective criminals’ car information and tag number, which they gave to the Sheriff, who paid them a visit at their home. Thanks to having the security system installed, they not only prevented inventory from being stolen, they also were able to stop the potential thieves from revisiting their store. Still Not Convinced You Need Business Security Systems? Think about the recent tragedy with the bombing at the Boston Marathon. FBI officials were able to use security cameras along with personal videos and photos from people like you and me to help piece together and make sense of the events leading up to the attacks. They were even able to use this information to identify the criminals responsible. This just goes to show you that having a security system for your business not only protects you, your employees, your information, your inventory and assets, it can also help save lives. Are you using a security system or camera in your business? If so, let us know in the comments below.